This is a really easy Bag review. 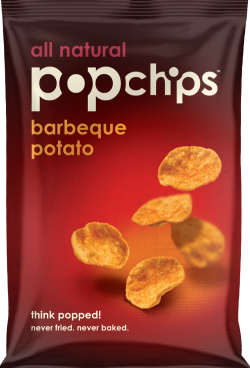 Popchips have gone for fantastic bold and bright colors to represent their flavors. The wording is small and modern. There is a good quality photo-image of the style of Chips. "Never Fried, Never Baked" is inspirational as a leading bag headline. These reconstituted snack discs cracked and creaked like biting through polystyrene before a very crispy and audible crunch. This crispy munch sustained until the mush stage that kicked in about three quarters of the way in. We will be completely up-front about our grading system here. A perfectly formed Potato Chip is the most aesthetically beautiful thing in the world of Chips & Crisps. These looked like flat-ironed Rice Krispies stuck together to form shiny orange and yellow polystyrene circular discs. A Nose Plunge Test revealed a spicy Barbecue aroma. The taste was similar. There was something slightly smoky about it, and this was added to by a spicy sweet tomato and maybe even a touch of onion.